Intertops.eu is one of my favorite places to play poker. They go way back, 1996 to be precise. They have recently accepted new accounts from the USA again. 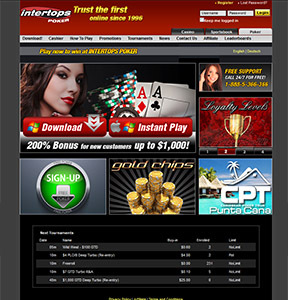 When it comes to big deal poker, Intertops is definitely one of the top sites. One look at Intertops’s tournament lineup and it’s clear that the poker site means business. You’ll find low-mid buy-in events every day of the week. The poker site also features some of the best promotions in the business, including a 200% up to $1,000 Deposit Bonus! Traffic at Intertops isn’t as big as some of the competition, but it does have a decent sized global player base, so you don’t have to wait before getting in on the action. You can experience Intertops no matter which device you use. The online poker room works on Macs and PCs through downloadable clients, on all devices through Instant Play, and on mobile devices without the need for an app.